Read Part 1 of Off-Season Conditioning: Squats here. To truly develop the athlete, proper muscle loading is essential. In this post we will examine glute vs quad loading. It is fairly easy to figure out which your player is doing, but a little bit harder of a fix. It takes a decent amount of awareness and focus from your player. They’re going to have to learn how to consciously recruit their glutes, rather than just doing a squat, and letting whatever muscles want to work the hardest take over. Same as before, have your player squat as they naturally would (body weight squat). Have them do more than they normally would, between 30-40. Ask them which muscle is tired, if none are tired yet, ask them which one would be tired if you made them do 100 more. If the answer is their glutes, you’re done! You can quit reading and scroll through your twitter for a little while instead. If they answered quads, looks like you’re stuck with me a little bit longer! As previously mentioned, glutes should be the primary lower body accelerator, decelerator and stabilizer. It is so crucial that players learn how to recruit their glutes. If they can properly use this muscle, the likelihood of them being able to jump higher, move faster, and avoid injury will greatly increase. Make sure you’ve fixed any knee loading before moving on. The fix may be that simple, have them hip load and bam! all of the sudden glutes are turned on, problem solved. If they are hip loading but still using their quads more, we are going to have to take a step back. Squats are a fairly complicated exercise, so we will do a simpler one, and have the player get used to recruiting their glute in that exercise. When they have that down, we will move back to squats. Have your player get down on the floor. We are going to do a glute bridge. 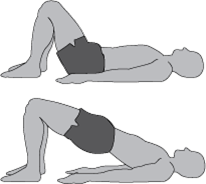 As they bridge up, ensure that they feel their glutes turning on to do that movement. Sometimes it helps to have them put their hands on their glutes, so that their brain has an extra cue for which muscle to turn on. Do 3 sets of 12. Constantly checking in to make sure they haven’t got distracted and fallen out of their glutes. It going to take some concentration on their part. Get them comfortable with exercise. After 3 sets have them hop up and try their squat. Do they feel a difference? If not have them get back down in the bridge and do another set before having them try squats again. If they got it, great! However, just because they’ve corrected it for now does not mean that its engrained yet. Stay on top it. Make sure you are asking where they feel it. If in a couple days they’ve lost it and they’re feeling it in their quads again, take them back down to the bridge so that they get used to using their glutes again. Like hip loading, repetition is important, so that it can become automatic. Once they can recruit their largest lower body muscle properly, you can start working harder on their speed, jumping and stability. This is where you should start see significant improvement. I’ve got to say this doesn’t make much sense to me. I may be wrong, I squat daily, workout people that squat daily,I am certified, all that jazz. It takes a lot more work to “wear out” the hamstring than glute and the quads. Yes, all three muscle groups are working during concentric and eccentric phases of the movement, for stability, balance and power. But to say that one should be tired first doesn’t make too much sense. That could also depend on the athlete, are the quad dominate, do they have under-developed posterior chain muscles. Also, we want to think about loading the hips just as much as the quads and glutes. I love the content on here and am not usually quick to comment with feedback that can be perceived as negative. Let me clarify, the point of asking which tires first is to try and figure out which muscle is dominating. If player claims quads feel most fatigued they are probably over-activated in their quads. We want to figure out muscle imbalances with this assessment, and be able to train with focus on the correct muscle activations. Without this focus players will get stronger, but they will be strengthening their already-existing misalignments and imbalances. Say the player has glutes that are under-active, undeveloped, and less likely to be chosen by the brain to fire when they are supposed to fire during a squat. 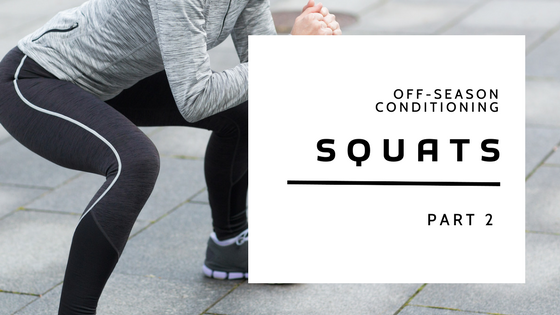 When they perform exercises such as squats and lunges, they will still become stronger but will be strengthening and reinforcing inappropriate use of their quads. Eventually, this can lead to things such as knee pain, as subtle strains are inappropriately put on the joints with each repetition that is performed with the wrong muscle activation. Yes all muscles are utilized and important during a squat, but it is crucial to make sure that glutes are selected by the brain as the primary actions for squats, lunges, basically anything that requires the lower body to accelerate, decelerate or stabilize. This is why taking a step back from squats and re-teaching players how to fire and recruit their glutes can be beneficial. Thank you for the reply Kelsey, good stuff. I find that most are quad dominate and lack the end range mobility and stability squat full depth. We can all do a better job at developing basic movement patterns that all athletes should have. It pains me that most kids when they squat come up on their toes, imbalance like that will kill the knees eventually (like you said).